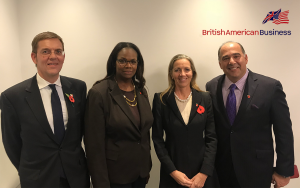 London – On Thursday 1 November, BritishAmerican Business held its 2018 Annual General Meeting, at the offices of McKinsey & Company in London. At the meeting, Dame Vivian Hunt DBE, Managing Partner, UK & Ireland, McKinsey & Company was formally appointed to the role of Chair, succeeding Christopher J. Perry, President, Global Sales, Marketing & Client Solutions, Broadridge Financial Solutions. Dame Vivian has been an active member of BAB’s Board of Directors for many years and brings with her to the role over 20 years of experience in the private sector, previously leading McKinsey & Company’s Pharmaceutical & Medical Products practice in EMEA. Attendees were also joined by Baroness Fairhead CBE, Minister of State for Trade and Export Promotion, who delivered remarks on the special relationship and the importance of the transatlantic trade and investment relationship for the UK. “It is my pleasure to welcome Dame Vivian as the new Chair of our Board of Directors. Dame Vivian’s experience and network, developed throughout her professional career and as an active and engaged member of our Board, makes her the perfect candidate for this role, and I look forward to working even more closely with her in the coming months and years. I would also like to give my sincere thanks on behalf of BritishAmerican Business to Chris Perry, who carried out the duties of Chair with absolute excellence during a time of significant transition for the organization. His leadership during this time continues to be greatly appreciated by us all.